NASA's Dawn spacecraft arrives at Pad-17B of the Cape Canaveral Air Force Station in the early morning on Sept. 11, 2007. Next stop - the Asteroid Belt. Abeleaguered NASA probe bound for the solar system's two largest space rocksreturned to its Florida launch pad Tuesday after two months of delay. 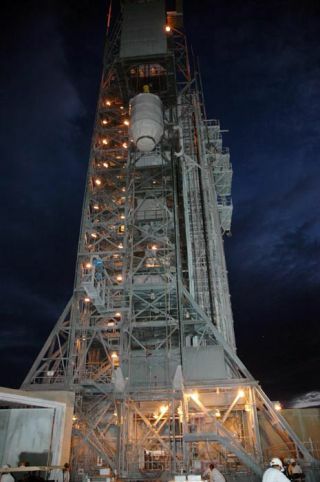 Engineershoisted the space agency's Dawn asteroid probe atop its Delta 2 rocket at theCape Canaveral Air Force Station following a series oflaunch delays and scrubs earlier this summer. "Fromhere, the only way to go is up," said Dawn project manager Keyur Patel, ofNASA's Jet Propulsion Laboratory in Pasadena, California, in a statement. "We are looking forward to putting some space between Dawn and MotherEarth and making some space history." Dawn isslated to begin its plannedeight-year mission to the asteroids Vesta and Ceres with a 7:25 a.m. EDT(1125 GMT) launch on Sept. 26. Vesta is abright, dense asteroid, while the spherical Ceres is large enough to beconsidered a dwarf planet. Dawn researchers hope that by studying the twospace rocks, they will better understand how planets formed in the earlysolar system. Earlierattempts to launch Dawn in July were plagued by bad weather, booster glitchesand difficulties in arranging air and ship-based tracking systems for theplanned liftoff. Missionmanagers opted to postpone Dawn's mission until September, after the launch of NASA'sPhoenix Mars Lander. The delay is expected to add about $25 million toDawn's $449 million mission cost, NASA has said. NASA alsocanceled Dawn's mission outright in March 2006, but reinstated the asteroidexpedition a few weeks later after reevaluating budget and technical hurdles. Dawn isslated to rendezvous and orbit Vesta in 2011 before heading off for a February2015 appointment with Ceres. Both asteroids sit in the Asteroid Belt that runsbetween the orbits of Mars and Jupiter. NASA mustlaunch Dawn by late October, after which its space rocktargets will begin moving away from one another in their respective orbits.After Dawn's 2007 launch window, Ceres and Vesta won't be near enough to oneanother for about 15 years, mission managers have said.